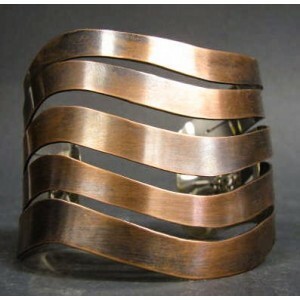 Handcrafted of Handwrought Copper Rebajes Designed Bracelet In 1945 Francisco (Frank) Rebajes said to his Foreman, Otto R. Bade, "The war is over let's make something beautiful!" 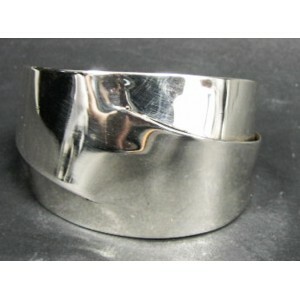 Frank made the prototype of this cuff and Otto asked him what do you call it? "What do you mean?" Frank replied, "It's a masterpiece, call it my masterpiece!" 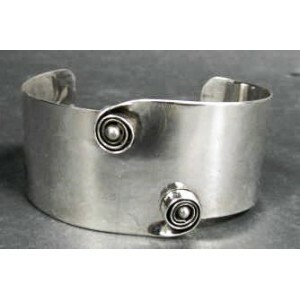 Handcrafted of Sterling Silver Rebajes Designed Bracelet In 1945 Francisco (Frank) Rebajes said to his Foreman, Otto R. Bade, "The war is over let's make something beautiful!" 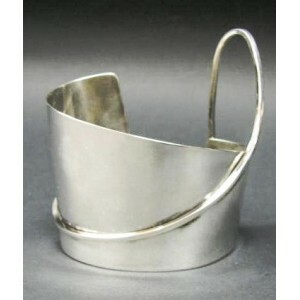 Frank made the prototype of this cuff and Otto asked him what do you call it? "What do you mean?" Frank replied, "It's a masterpiece, call it my masterpiece!" 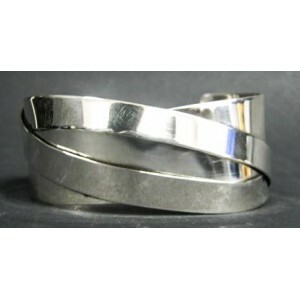 Handcrafted of Sterling Silver 1 1/2" Wide. Opening approximately 1 1/2" An original Rebajes -- the first name in copper and sterling silver art jewelry This piece is from the private collection of Otto R. Bade, the owner of the Rebajes Brands and former craftsman and manager for Rebajes in the 40's and 50's. 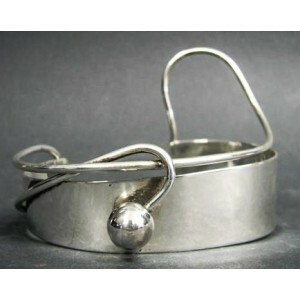 Handcrafted of Sterling Silver 2" Wide. Opening approx. 1 1/2" An original Rebajes -- the first name in copper and sterling silver art jewelry This piece is from the private collection of Otto R. Bade, the owner of the Rebajes Brands and former craftsman and manager for Rebajes in the 40's and 50's. Handcrafted of Sterling Silver 3" Wide (on one side) An original Rebajes -- the first name in copper and sterling silver art jewelry This piece is from the private collection of Otto R. Bade, the owner of the Rebajes Brands and former craftsman and manager for Rebajes in the 40's and 50's. An original Rebajes -- the first name in sterling & copper art jewelry This piece of jewelry is from the private collection of Otto R. Bade, owner of the Rebajes name and former craftsman and manager for Rebajes in the 40's and 50's. 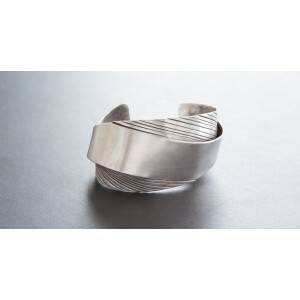 2-1/2" Wide and 1-1/4" High Opening 1 1/2"
Rebajes Designed Bracelet 1.5 inches at its widest point Opening 1.5 inches Diameter: 2 3/4 inches Polished or brushed with beautiful antiquing near the twin curls. 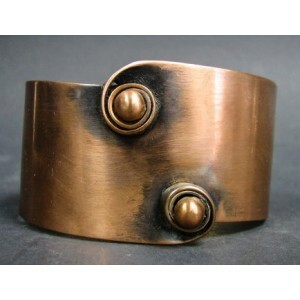 Handcrafted of Handwrought Copper 2 1/4" Wide. Opening approx. 1 1/2" An original Rebajes -- the first name in copper and sterling silver art jewelry This piece is from the private collection of Otto R. Bade, the owner of the Rebajes Brands and former craftsman and manager for Rebajes in the 40's and 50's. 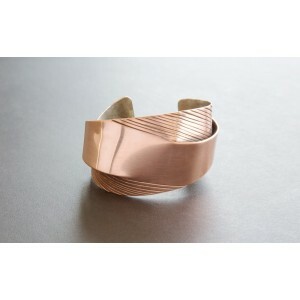 Handcrafted of Handwrought Copper Rebajes Designed Bracelet Measures 1.5 inches at its widest point. Brushed with beautiful antiquing near the twin curls.